Mail call: postal customers lined up at temporary post office Tuesday. The Edgartown post office reopened Tuesday in its new location in the Carnegie building. Residents, many of them weary from shuttling to Vineyard Haven and back to get their mail for the past week, were alerted to the news by text message. By noontime people were lined up to get their mail. A postal worker was outside handing out packages from her list from the day before. The weather had turned rainy. According to a press release from the U.S. postal service, separate lines will be established based on PO box numbers and additional staffing has been brought in from neighboring communities. Parking rules on North Water street have been changed to accommodate postal customers, with 15-minute parking available from the Carnegie building to Morse street and continuing up Morse. Post office hours at the new location will be Monday through Friday, 8 a.m. to 5:30 p.m., and Saturday 7 a.m. to 1 p.m. Retail services, including purchasing stamps and mailing packages, are available at the post office station at 29 Church street (except for international shipping). 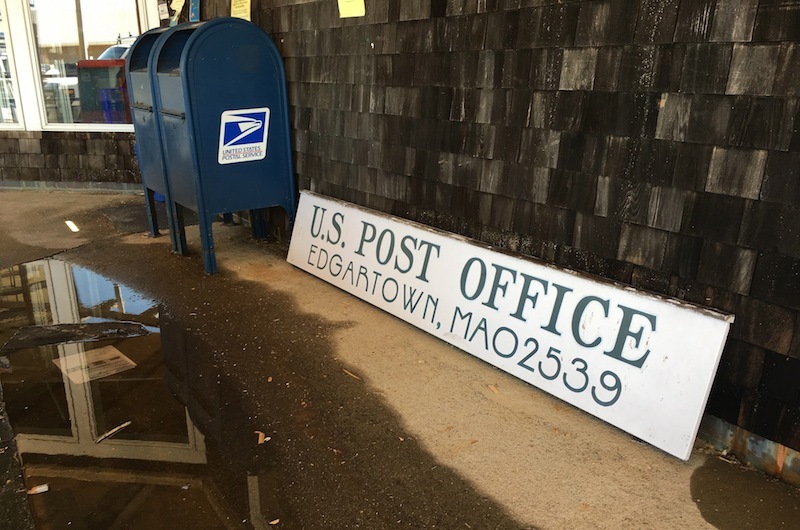 "We thank our Martha's Vineyard customers for their cooperation and their patience during this temporary relocation while repairs are made to our original Edgartown Post Office facility," the press release said. Customers with questions or comments are asked to call 1-800-275-8777 or send an email through usps.com. At a selectmen's meeting Monday, Edgartown town administrator Pamela Dolby said she expects the water-damaged Edgartown post office branch at the Triangle to be repaired and ready to reopen in about a month. Mrs. Dolby said she has been in touch with post office administrators constantly over the past week after the ongoing situation regarding the town's main post office, which has been closed since April 1. Last week Mrs. Dolby facilitated an agreement to open a temporary post office at the Carnegie building now owned by the Martha’s Vineyard Preservation Trust. For severel days Edgartown postal customers were directed to Vineyard Haven to pick up their mail. The post office building at the Triangle is owned by Charles Hajjar, a Milton real estate developer. A large construction project is under way on the building to add apartments to the second story. With the roof open to the elements, rain has been leaking into the building in recent weeks. Torrential spring downpours exacerbated the situation and the building was closed. Mrs. Dolby said Monday that all parties have agreed the main post office will reopen no later than June 1. But the target for completed renovation came after one more frustrating day. 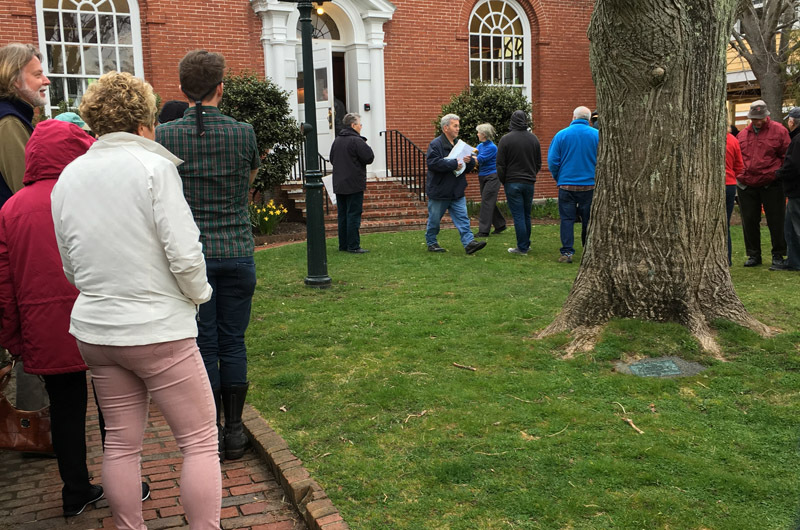 Postal officials told customers to pick up their mail and packages at the Carnegie building beginning Monday, but then told them that mail was not available there, or at the temporary operation in Vineyard Haven. “We’ve done everything we can do,” she said. Thank you for all your efforts.. I have to say the most refreshing part of todays rainy wait was the cheerful and helpful customer service provided by Lisa and two new postmen who I assume were shipped in to help from off-island. They were polite, efficient and funny and it made all the difference! Not everyone left with what they were looking for but at least they were treated with respect and a smile. Could the Edgartown PO renovate the building and the customer service?? Will we be required to line up outside the Carnegie building in inclement weather until the Post Office is re-opened? Will 15 minute parking restrictions be enforced? I was in line for at least 35 minutes yesterday.